the weather has been consistently warming up lately and all I can think about is light weight shirts, skirts, and dresses. Since I usually do a bi-annual closet purge ( once in the fall, the next in the spring), I think I may add closet organization to my list of things to tackle this week. It's not as large as I'd like ( there's another part to it, about the same size), but I'm hoping to get Alaa to build some custom shelving to help me out a bit. Currently, I'm using a book case ( pictured above) to showcase the shoes I wear most often. My other shoes are on a shoe rack tucked away. I've started using my clothes to style my house. 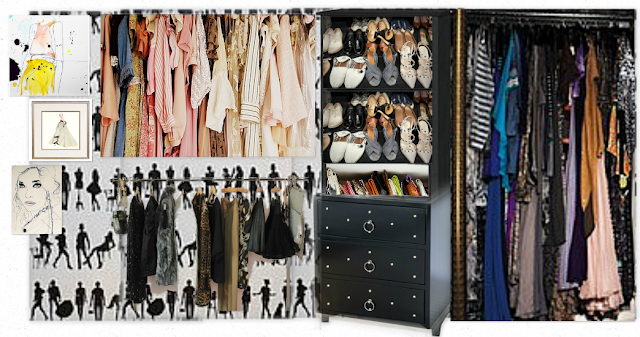 It's a great way to jazz up the rooms, and give me a bit more space in my closet. Here's a picture of a few of my favorite shoes lining the jacuzzi. How fun would it be to have all of my favorite shoes lining the perimeter of the tub? I may have to give it a shot! I've decided that before I actually start sorting through my clothes, I'm going to make out a list of things that I hope to wear in the spring. I think this will help me decide what to keep, what to throw out, and what I need to buy. I'll let you know how it goes! any tips on closet organization? i'm a sucker for those things! Even though I am short on closer-organizing ideas, dimly love your collection of shoes Nuha. That closet is really beautiful! I like the cream and green together.. very soothing. You should get one of those wall cubbies from Ikea, saves so much space and it's great storage for jewelry/ shoes. Walls shouldn't be forgotten, they are valuable! My closet looks definitely worse than yours!! I have to do something abut it!! My wardrobes are teeny tiny! When we moved I tried persuade the bf to let me have the spare bedroom as a walk in wardrobe. It didn't work =( I'm slowly changing it into one though =p It will be my room soon! I need to get on the closet rearrange and organize train right along with you! Especially with spring coming up! Love you closet mood board! What a great layout! I saw your pics and I have to say: you`re beautiful!!! Please visit my blog again, you are always welcome! Gorg blog! That closet is amazing both in its design and what is inside . . . .
Oh wow, you've such a great blog! i love your style and also all your other posts, they are very interesting! I'm a new follower via bloglovin, perhaps you have some time to visit my blog too? and if you like it, I'd be very happy to have you as a new reader and perhaps follower too! I'm needing to organize my closet too. When I do this, my friends' office are happy, because I give many gifts! Thank you so much for your sweet comment Nuha! It would be amazing to have that wardrobe. I am right there with you on organizing the closet for spring-still tackling that project! ;) Great post!